Mercury retrograde causes great confusion and often misunderstandings in terms of work and also within your day to day relationships. You may feel rather flustered, short-tempered and certainly less patient. Traffic, slow computers, incompetent services can try you. Nothing you count on day to day can be relied upon, and so you should not leave extra time to iron out glitches and correct problems. Be sure that memos get sent and chase people up to be sure they got the message and interpreted correctly. Be succinct, the more words you use, the more chance there is of a misunderstanding. This month you are quite circumspect and will take the time to prepare, check, and gather facts. You are keeping your powder dry regarding not revealing your aims or strategies yet; you want to be sure when you do express your opinions you cannot be shot down in flames. This is a time when you spend a great deal of time pondering; it is not daydreaming but more like developing ideas and philosophies on which to base your actions during this year. You may be inclined to keep secrets in January, not because you have anything to hide, but perhaps because you have feelings which you are not yet certain how to express. Or in other cases, you need to dwell on certain things and decide how you really feel about them before you express them to others. It may be that you have a piece of information which could be devastating to some person, and you need to spend time thinking about how you can deliver this information or whether it is best left to someone else. Meditation, mindfulness, yoga and other relaxation techniques can be very helpful to both relax you and free the creative process. Often these methods of soulful awareness can aid you in streamlining your goals for the year and deducing what is most important regarding your overall development. 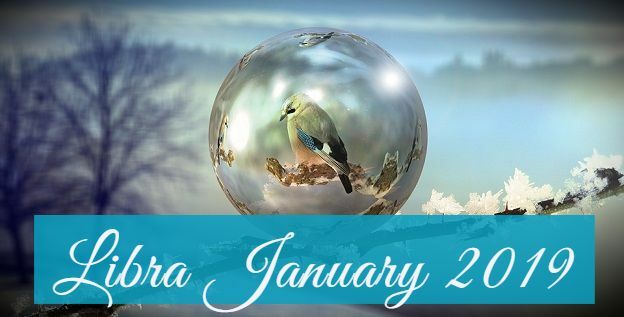 Libra are in a very romantic mood in January, and you are inspired by the higher, more spiritual aspects of love, i.e., the willingness to sacrifice, seeing the person for what they are spiritually rather than materially, love despite the odds, love in the face of opposition. In many ways, love is more exciting for Libra when there is opposition or a sense that you are saving someone or being saved. Sometimes your attitudes to love are not very practical; in fact, you are not motivated by logic and reason when you meet new people, you are motivated by feeling and raw emotion. You will also tend to be highly idealistic in love and have unusual romances which begin in extraordinary ways. Libra who are in relationships need to be careful not to become insecure in your relationship or even despairing of it due to the shop window effect. The shop window is where you look on Facebook and become deluded that everyone else’s life or relationship is perfect; you then judge your own love life on this false ideal. This month you are less willing to deal with problems and more inclined to hanker after an ideal that is not achievable. There is no such thing as perfect, all relationships need to face up to challenges. This may not be the best month to tackle relationship problems (in a rational and systematic way), but you can have a dramatic improvement in all relations by showing compassion and unconditional love. Often plans have to be reworked or tweaked as the practical application was not quite like the theory. There can be quite a bit of trial and error testing. Sometimes people or systems which are usually reliable break down, and you are forced to try new methods which may experience teething problems. This can be a frustrating time for those of you who work from home – you may have problems with your internet, disruption from neighbours, noise nuisance or family interference, i.e., kids staying home and disrupting you. This may be the month when you transfer a great deal of physical data (perhaps from your archives) onto digital formats so that you can access it more easily; this can be quite time-consuming, and you need to stay mentally alert as concentration can lapse, and you may categorise incorrectly. Artistic and musical talent is greatly enhanced this month, and you can generate ideas and begin new projects with great inspiration. You are best dealing with the arty areas of your work rather than the mundane or admin parts – in some cases, it may be best to contrast out bookkeeping or admin and lock yourself away so you can create and brainstorm in peace. A very good month to go on writer’s retreats or engage in activities where you mingle with like-minded artists and share ideas. An excellent month for Librans who work as negotiators or counsellors as you can gain an advantage through your intuitive understanding of the deeper emotions and needs at stake.